It’s always exciting to try ingredients you’ve never used before – although I sometimes (OK, often) miss the food from my country, one of the positive aspects of moving to the UK is that it’s more multicultural and so we can get many different types of ingredients that I’ve never tried before. I’ve had this distinctive ice-cream here and absolutely loved it. I vaguely remembered that the recipe was included in the Clarks’ book and I was right – I wasted no time finding the right page, but soon realised that there was one ingredient I couldn’t get here – called gum mastic. It’s a resin from a tree native to Greece and Turkey and people there chew it instead of chewing gum. In the book, the Clarks say that you can omit the gum mastic, but I really wanted to try using it and checked Greek/Turkish suppliers in London – there were quite a few, but none of them were located conveniently for me so I had to give up going myself. I knew I could ask Shalimar about it, though :) She is a world traveller, but has lived in Greece for a while now. She knew exactly what I was talking about and sent me some mastic straightaway, I was actually making the ice-cream just a few days after I was asking her about it, she is indeed a kind-hearted soul. 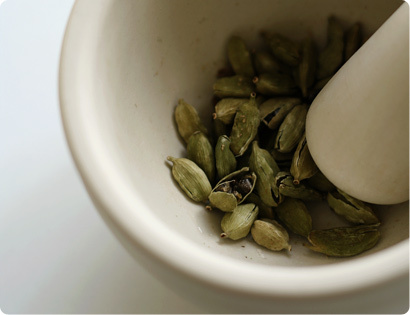 Crush the whole cardamoms in a pestle and mortar, take out the pods leaving the seeds then pound the seeds to a fine powder. Place the milk and double cream in a saucepan, add the ground cardamom and cinnamon stick. Bring to the boil and simmer over a low heat, stirring occasionally, until the liquid has reduced by about a quarter to a rich creamy colour (it takes about half an hour). Place the sugar and rose water in another saucepan and dissolve the sugar over a low heat until it becomes a thin syrup. Remove from the heat and cool. When the milk and cream are ready, remove from the heat and stir in the crushed gum mastic (if using) and cool for about 15 minutes. Sieve the liquid and discard the solids. Add the evaporated milk and combine with the rose water syrup. Cool and chill. Churn in an ice-cream machine until thick enough to scoop (if you haven’t got a machine, freeze the chilled mixture, giving it an energetic whisk with a hand whisk or electric mixer every half an hour or so to prevent crystallisation). Sounds freally interesting this ice cream! But what does the gum mastice taste like in itself? Spicy or like resin in general? Looks delicious. I have been planning to try an ice cream recipe for some time, how ever I was scared. You gave me courage. Wow, that’s an absolutely gorgeous photo of ice cream! I know what you mean about it wilting... even as simple as my photo for the pistachio ice cream that i made, i had to click click click quite rapidly so as to just get a picture.... any picture! This looks delish indeed. wow! gum mastic, this is something new I learn today! yeah, love to know how it taste like as well:) And one tablespoon of green cardamon, oh dear, is it too overpowering? it’s really a nice mix all those different flavours ! Never heard about gum mastic and I’m curious about it ! Looks nice ! As usual your photo is perfect! Gum mastic? I’ve learned something new today! And it looks to be a curious looking ingredient.---Seeing your cat makes me miss Maddie, I hope she won’t forget me. Keiko - fantastic as always! I love that opening shot. The blue tablecloth is gorgeous. You always seem to have fun experimenting with uncommon recipes. gorgeous shots indeed!and looks yum! It must be wonderful Keiko. And i am very curious about the taste and smell of gum mastic. Sounds absolutely fantastic. I love the different ingredients. OOh, I love the kitty picture. I hope there are kitty pictures in every post. Alas, I’ll settle for the gorgeous food photographs too! I’ve had mastic turkish delight (loukhum) and had to spit it out. This does sound interesting though...and the pictures are sure convincing. To all those who wonder what gum mastic tastes like, Harold McGee describes it as resinous, with piney and woody characteristics. Apparently the resin comes only from a particular tree on the Greek island of Chios, and it’s not very soluble, so it has to be finely ground and mixed with another powder -- like the caster sugar in this recipe -- if it is to be "dispersed evenly" in a liquid. So inviting and yummy photos...I’m not sure if I’d like rosewater, cardamom, guy mastic tastes in my ice-cream though ;-P You’re very creative...brilliant! I also don’t like lavender taste ice-cream I tried in Nice one day...garlic ice-cream? no way...I didn’t even want to give it a try...maybe I should just to know, but the thought of it already makes me take less risks :-D I see so many flavors to ice-cream nowadays...flavors that I never thought would be possible in ice-cream...amazing. Shooting ice cream can be tricky, can’t it - but as usual you’ve pulled it off in stunning fashion. One time I made ice cream at my boyfriend’s place and didn’t realize until I was ready to take pictures that he had no ice-cream scoop! So I got to practice making quenelles with some spoons instead...:) You definitely have a knack for finding the most fascinating recipes to try, and beautiful results! Super pretty photos as usual. Sounds delish to boot. i’ve had a similar ice cream and it is a storybook of a flavor in that conjures up fantasies and seems to wake up a part of your brain last sparked when you were a kid. but it’s such an adult flavor, as some would say. i love gum mastic. a friend of mine taught me how to make Pascha bread with some of the stuff pulverized. with an eggy dough, it is really addictive. i love the blue with the pale rose ice cream, beautiful! I love gum mastic and was looking for some recipes to try it out. I think I will make a cookie version of your ice-cream recipe. You are such an inspiration! this post is so wonderful as usual with the pics but also with the recipe! I love the smell of mastic gum, the turkish double cream, cardamom... I have turkish origin;) I have to try this ice-cream! Once Rob mentioned the pine/wood taste of gum mastic, I guess I’d have to agree since it is a resin although I’ve always thought of it as 1/4 minty, 1/4 clovelike and 1/2 ginsengy. I love it! Hi everyone, thanks so much for all your feedback. Ilva - like Sha was saying, it’s more about a fragrance than an actual taste. It’s not really spicy, more of a refreshing flavour I’d say. Sha - thanks again for your kind thoughts, I still remember the lovely aroma when I opened the package, made me want to visit there some time... I hope you’re enjoying staying in France (I’m sure you are), looking forward to hearing about it, take care. Sandra - I hope Tatina is keeping well too, send hugs from me. Slurp - I know 1 tbs sounds a lot, but it was just right - of course you can use less. Rowena - of course Maddie is missing you too! Joycelyn - I’m glad you were interested in this ice-cream too. I didn’t know it was featured in food monthly, I guess he likes it too :) Hope you can try it some time. Maya - do you remember I put a recipe for the lavender and pear ice-cream some time ago? I’m still not a fan of strong flowery flavours, but it’s very subtle and enhance the whole taste. Vanessa - I agree with you about ’an adult flavour’ - your Pascha bread sounds wonderful, have you written about it yet? Plase let me know if you have. Bakingfairy - what a lovely name you have! :) Your cookie version sounds fantastic, please let me know when you make them. Dilek - thank you, I’d like to hear if it’s authentic enough. Is Turkish double cream very different from ’normal’ one? Hi Keiko,nice to see another fan of gum-mastic.Heavenly flavour, isn’t it.You can get gum mastic in Middle Eastern stores in london easily..They usually don’t put in display,because it’s expensive, so you have to ask the shop owner. And also I have gum mastic preserve-jam recipe in my blog if you want to see..
ice cream- something still unfamiliar for me to attempt myself. nevertheless your post prompts me to go out and get a scoop now! Wonderful blog and the best pictures I have seen, I was hoping you could give me some pointers on photographing my desserts, I am having a very hard time and I think it may be the lighting. It is so nice to be able to share thru blogging with people from different countries. I am in Houston and am a chocolate maker. Thak you again for such a beautiful site. That’s magic! It’s just as if I could smell your photos!!! Your blog is beautiful! I am definately a fan of your food and photos. I’m going to add you to my blog roll. Thanks! Hi Keiko, that ice cream sounds and looks fantastic. I remember seeing it in the Moro cookbook, but wasn’t familiar with gum mastic. 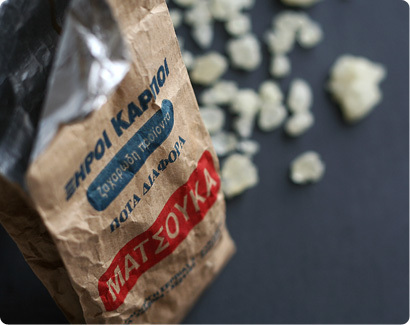 I’ll have to keep my eyes open to see if I can find any locally at some of the Greek stores. Both yours and Susan’s descriptions of the flavors make it sound very worth seeking out. Thank you for a lovely post. This kind of ice-cream is widly known in arabic countries. And the gum mastic (we arabic people call it: MISTEKAH) can be found in supermarkets easily. 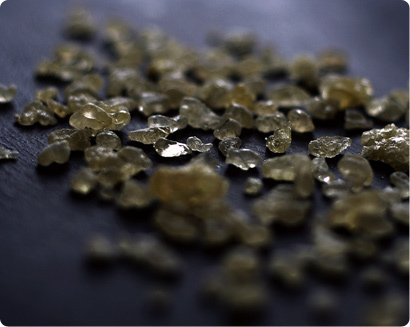 MISTEKAH or gum mastic is also used in flavouring sweets, doughs and some other savory dishes. 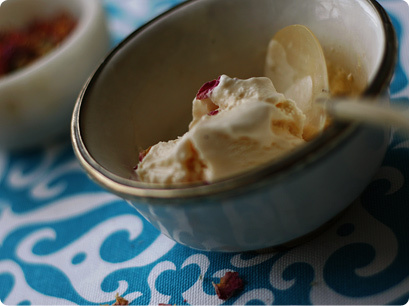 Hi Keiko, Your ice cream recipe inspired me to make an Indian milk dessert with the same cardamom, rose water and gum mastic for my blog. It turned out well, thanks so much! Hi, just ba chance I came to see your Gum Mastic interest. We have a store / mailorder business which specializes in difficult materials. We ofer Gum Mastic 1a quality from Chios in Greece, # 60050 , 100 gramm cost 21 Euro from Germany or 29 US $ from our store in New York. 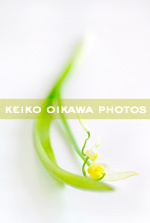 Hey keiko - congrats on the olive mention but I am so bummed they had a typo on your url! Hi Keiko - What amazing artistry. I just love it! I live in Paris at the moment but know London and Norfolk well so it’s just wonderful to be able to look at all the pictures. Even more so since I used to have a cat just like Maya, one of the most regal creatures on earth. Hi there, thanks so much for all your feedback! Betul - thank you for your tip, I’ll try to ask next time. Could I ask the name of the shops you normally go to? Connie - it must be one of the best jobs being a chocolate maker... I always use day light to take food pictures, although I know it’s difficult for lots of people to do that. Pille - oh I can’t wait to see your beautiful creations! Have you posted some of the recipes already? What’s mahlepi like? Brett - I wasn’t familiar either, but I’m glad I’ve tried it in the ice-cream. I hope you can find some where you live. Latifa - thank you for your info, what kind of savory dishes are there using mistekah? Sounds wonderful! Susan - I’m glad you enjoyed it, your Indian dessert sounds lovely! This post is one of your most beautiful yet. It’s like a dream about food. For those in the U.S., mastic gum is available at http://www.bestturkishfood.com/item.php?iid=1150. Hi Alex and Mike - thanks so much for your kind words as always, I hope you enjoy the ice-cream. Hi Keiko. Tried the "booza" recipe and it was really very good. There is a more simple and less calorific one which tastes just like the icecream we get here in Lebanon. Also have many fruit flavours here too. Wish I could get the recipes for those! The latest is to swirl whipped cream on top of the arabic gum [ called miskey] icecream. Soooo good! Love your website. good luck, and keep going! Hi Paula - thank you for your kind notes. I’m new to Lebanese cuisine, but I know it is wonderful :) All of the recipes sound fabulous, please share some with us when you have them. Google “ Gum Arabic” and see what you find. I use this in waterbased paint recipes. It is edible and quite cheap here in the U.K.. I think it is the same thing. this is similar to Maras dondurmasi. You wouldn’t happen to have that recipe also, would you? Wow I love ice cream and cookies.. my favorite stores to buy them are Davids, Cooking.com, Dale&ThomasPopcorn, Mrs.Beasleys FannieMay at couponalbum.com.. I from Hong Kong and watched TV show “ My Greek Kitchen”, and 1 of the episode is dessert “Haluvas Nisticimo” with crystralline “mastic”, but it cannot find in Hong Kong any cake food product shop, so can you recommend any other to replace it ! Thank! Any other product can replace Mastic, cos I cannot find in my town. Hi there, thank you for all your notes and I’m sorry it’s taken so long to get back to you. Dante – I’m sorry but I don’t! Kay – it seems like quite a few people are selling it online. Polly – I’m sorry but I don’t know what you can use as a substitute – I’ll try to ask some friends who might be able to help me. Woh.. what a nice ice cream. I want to taste these after seeing. Cardamom and Gum Mastic Ice-cream is totally new for me. very interesting and something I would like to try. Was the “yoghurt and semolina syrup cake with rosewater” you refer to in your post some version of “basboosa” – with samneh (ghee)? Did you try it? Interesting, I have not tried using evaporated milk to make ice cream, will definitely try it! We made this tonight (without the mastic). It was divine. Thanks! The ice cream looks lovely, if you don’t mind I pinned the first photo too. I have never tried gum mastic, so many ingredients to try! Well, at least the rest I can find here in NZ :-). 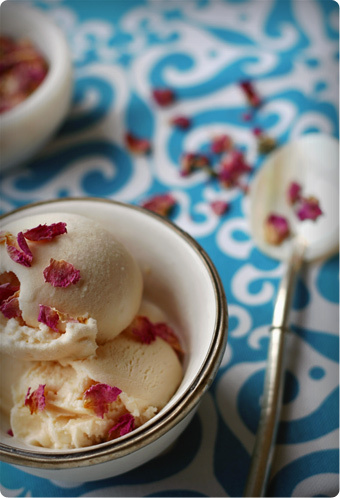 Keiko, love, love, love your blog and this recipe with the cardamom and the rosewater and the ice cream — divine! The mastic reminds me of when I was a little girl in Greece. 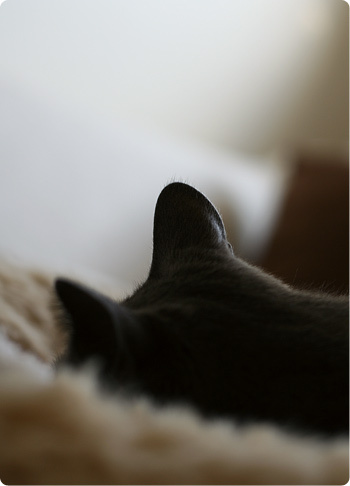 Gorgeous and inspiring pics — thanks for sharing!